Registering yourself in job portal, polishing your resume, searching for your dream job, planning your dream company, those are the most important things in mind of students whom are going to graduate this semester after completing their study. Everyone is hoping to find a suitable job, job they like, but searching blindly through the job portal and sending resume to random companies might lend you end up with a terrible job that you dislike. Instead of searching blindly, why not attending the Karnival Kerjaya dan Keusahawanan Graduan 2010 organized by Ministry of Higher Education (MOHE) and collaborated by Jobstreet at Putra World Trade Centre (PWTC), Kaula Lumpur on 14 – 16 May 2010 where you can get all you need at the same place and the same time. Currently, there are more than 400 companies offering more than 8000 jobs in this event and the number is still going up. The companies range from local company to multi-nation company and the working field cover from technical to non-technical field. There must be a job that suits your need, no matter what qualification you hold. There are even expert from Jobstreet offering Resume Clinic at there too, so don’t miss the chances to polish up your resume. Don’t miss this chances. 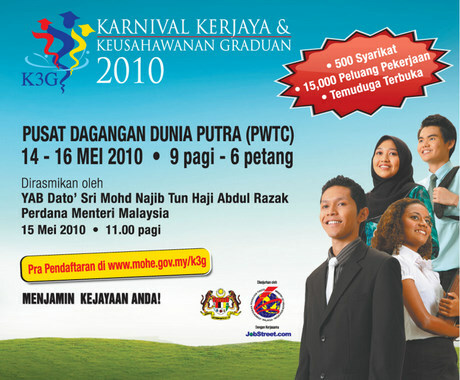 Register yourself before 16 of May 2010 and search for your dream job at Karnival Kerjaya dan Keusahawanan Graduan 2010. The registration fee is free! Remember to bring your resume there for job application and open interview.